That's the grim world described in Grandmaster Flash and the Furious Five's 1982 classic "The Message," the first hip-hop song to draw widespread admiration from music critics and fans alike. It's also the first music Loren Kajikawa, born in Los Angeles in 1975, remembers. "My earliest musical memories were hearing hip-hop and rap," he says. As an assistant professor of musicology and ethnomusicology in the UO's School of Music and Dance, Kajikawa now puts his lifelong love of the genre to scholarly use in his classes in musicology, music in the 20th century, music of the Americas, American ethnic and protest music, and yes, hip-hop music. He didn't decide to pursue hip-hop academically until his final year as an ethnic studies major at the University of California, Berkeley, when he wrote his senior thesis about Asian American jazz musicians. During the process, he gained a deeper understanding of the role music could play in forming ethnic identity. "I realized retroactively that all that listening had been a kind of training," says Kajikawa, who is Caucasian and Japanese American. "I'd been doing research all these years!" Early on, academics struggled with outsider status when it came to studying popular culture and music. Some European observers initially dismissed, for example, Javanese gamelan music and African drumming as "primitive" because of the lack of harmonic development that defined genius in 19th-century Europe. But they were approaching the genres from a limited perspective, entirely missing the melodic intricacy of the former and the rhythmic sophistication of the latter. Composer Claude Debussy was among the few 19th-century Europeans who took non-Western music seriously, noting that "Javanese music obeys laws of counterpoint that make Palestrina seem like child's play, and if one listens to it without being prejudiced by one's European ears, one will find a percussive charm that forces one to admit that our own music is not much more than a barbarous kind of noise more fit for a traveling circus." Kajikawa was cognizant of his outsider status when he decided to address hip-hop as a scholar. Serious study of the genre had only begun in the 1990s, and when Kajikawa began researching hip-hop in graduate school at UCLA in 2001, he entered an academic world that drew criticism for studying pop culture—from graffiti to comic books—that some deemed unworthy of serious academic attention. But times have changed. "It's gone from maybe a week in a popular-music survey course to now starting to see people of my generation able to teach entire classes on the topic," Kajikawa says. 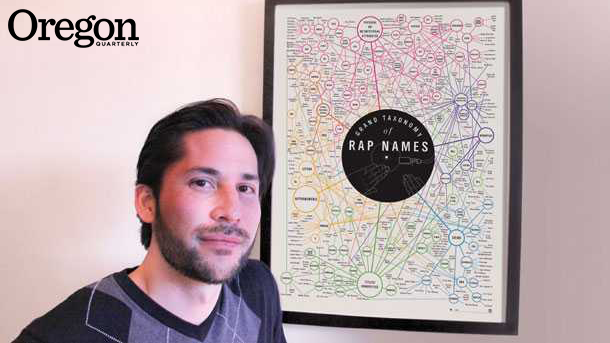 His work at the UO examines the creative decision-making at the heart of the most inventive hip-hop, and also aims to help overcome popular misconceptions. "It's important that people understand there's no one kind of hip-hop," he says. "Over 35 years of recorded music history, there's an incredible diversity of artists, styles, politics, aesthetics, geographic diversity, and audiences under that umbrella." Listeners attuned to musical styles with "long singing melodies and complex harmonic progressions, where you're really being taken on a kind of journey," may miss out on hip-hop's virtues, which are instead "built on repeating grooves and beats," Kajikawa explains. "The challenge for producers is to create beats that, even though repetitious, are pleasurable to listen to. There's less emphasis on harmonic development, but producers pay a lot of attention to timbre," the character of sound apart from its pitch. "It's about the creative juxtaposition of different timbres—samples of an obscure record from the '70s, a James Brown drum pattern, a classical Indian raga—and the interaction between different layers of grooves," he says. "That's the aesthetic pay dirt." Beyond the music, hip-hop also prizes "the lyrical and rhythmic virtuosity of the MC or rapper, the way the rhymes are constructed, at the level of both content and form—that's where a lot of the pleasure is for listeners," says Kajikawa, who sometimes asks students to memorize a complex hip-hop arrangement so they will see how difficult it is to create. "There's a real sense of artistry that is not always audible to all listeners." In a presentation about early hip-hop at the Rock and Roll Hall of Fame in Cleveland last year, he coordinated audio samples with his own measure-by-measure graphic transcription of a live 1978 track to reveal how the legendary DJ Grandmaster Flash ingeniously mixed various elements—vocal lines, instrumental breaks, loops, precisely timed transitions, beats, scratches—just as composers have done with other musical elements throughout history. With a contagious enthusiasm and lucid explanations, Kajikawa successfully juxtaposed "academese" terms such as "narrative structures" and "repeating cycles of symmetrical beats" with verses such as "Let's rock, y'all, non-stop, y'all." His illuminating talk and scholarly publications demonstrate the value of rigorous, informed study of one of today's most pervasive and important cultural phenomena. His UO students don't need convincing about hip-hop's value. "Students come in with a healthy level of interest and investment in the music already," he says. "I have to turn dozens away every time I teach it." Hip-hop has thoroughly permeated mainstream culture. The story of the great, doomed rapper Tupac Shakur is coming to Broadway; Nas just performed a 20th anniversary concert celebration of his classic album Illmatic with a full orchestra at the Kennedy Center; the Roots have replaced Doc Severinsen in The Tonight Show band. "I'm old enough to remember the growing pains: the way the music was considered a passing fad, and the moral panic, similar to rock in the '50s, stemming from anxiety about this form of music predominantly by African American artists," says Kajikawa. "It's difficult for students today to relate to that. They grew up in a world where hip-hop was in the top 40." In fact, that comfort level troubles Kajikawa. He encourages students not to treat hip-hop as mere background music or a finished product, but instead to closely examine the creative choices made by producers and artists. And he reminds students who haven't grown up in black communities that what they hear in hip-hop is "not necessarily a transparent reflection of what African American communities are really like. If you're getting your info about what things are like in the 'hood through music, remember that it is music and art—but it's also put out there to sell records. There's a critical approach that I try to emphasize." That's where Kajikawa's outsider status actually helps. "I don't ever pretend in my work or teaching that I speak for people who had a different upbringing, or understand what that's like," he says. "But I can call attention to social issues that are being raised in the music, from police brutality to devastation of economic opportunities in inner-city neighborhoods. We're all outsiders and insiders in various ways. Being an outsider in that way helps me connect with students and help them figure out how to connect to the music." His journey from outsider to expert mirrors that of musicology itself, which now pays serious attention to hip-hop and other nonclassical music. Kajikawa would like to see the School of Music and Dance, which he says is very supportive of his teaching courses in the history of hip-hop and studying it from an academic and historical point of view, reach students who want to be involved in creating and performing the music. "There's tremendous potential for the university to tap into the interest of students who want to learn DJ techniques and the basics of beat-making." Even for students who don't intend to become rappers or electronic musicians, "If you want to be a working musician today, you need that kind of versatility," Kajikawa maintains. "I see the future moving from just academic study to a totally well-rounded program with performance ensembles," as happened with jazz education half a century ago. "There were no jazz conservatories in the 1940s and '50s. Today, you have these amazingly vibrant university jazz programs like the one that Steve Owen leads here. I'm hoping the course that I teach is sort of a step in that direction." It's not the only one. He and his wife have a five-year-old son and nine-year-old daughter, and to help build their vocabularies, he's teaching them to memorize the lyrics of some hip-hop songs.